Call of Duty is on sale all over the place, with Black Ops 4 on sale from Blizzard and the rest of the franchise getting discounted on Steam. It's a good week for Call of Duty players, whether they be new school or old school. Black Ops 4 is getting a nice sale over on the old Battle.net, but if you don't feel like getting it right now, it's a good time to remind everyone that Blackout battle royale is totally free to play for now through the end of the month. That includes the original map and the new Alcatraz map. If you're looking for a previous Call of Duty experience, Steam has you covered. They have everything on sale going back to the original Call of Duty. And this includes Modern Warfare Remastered, for those interested in going back in time with a fresh coat of paint. Elsewhere, Steam has also put up the BAFTA award nominees for sale, so if you're looking for a strong indie game, now's the time to look for one. Pay $1.00 for Chaos Reborn, Rebel Galaxy, and Grey Goo: Definitive Edition. Pay $4.99 to also receive Rime, Immortal Redneck, Hover, Ash of Gods: Redemption, The Town of Light, River City Ransom Underground, Brawlout, and Heliborne. These keys activate on Steam. Or pay $7.49 for Redout Enhanced Edition, the Digital Artbook DLC, and the original soundtrack. Pay $12.99 to receive all of Redout's DLC. These activate on Steam. Find the full list of deals featured during the Green Man Gaming Capcom Publisher Sale. Subscribe to Humble Monthly for $12 and receive Assassin's Creed Origins with more games added every month. DRMs vary. Or pay $1 for ENSLAVED: Odyssey to the West, Pac-Man Championship Edition DX, and Impact Winter. Pay more than the average $10.31 to get Little Nightmares, 11-11 Memories Retold, Get Even, and Project CARS. Pay $15 or more to also receive GOD EATER 2 Rage Burst and SWORD ART ONLINE: Fatal Bullet. Pay $25 or more to also receive Tekken 7. These activate on Steam. Or pay $1 or more for Creature Romances, Kokonoe Kokoro, Highway Blossoms, and Just Deserts. Pay more than the average $9.74 to get Ladykiller in a Bind, Purrfect Date, and Genital Jousting. Pay $10 or more to also receive G-senjou no Maou - The Devil on a G-String Voiced Edition and Sunrider Collection. Pay $15 or more to also receive CLANNAD. These activate on Steam. Get your games by the bundle. 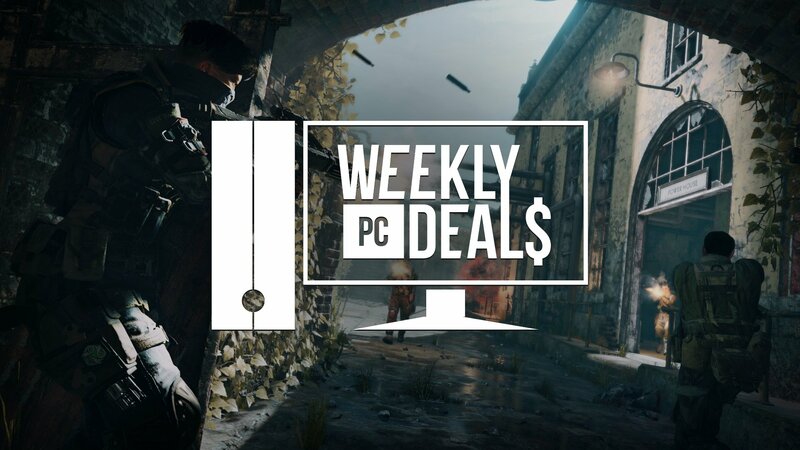 Find the full list of games featured in the Ubisoft Store's Bundle Sale. Find the full list of British Academy Games Awards nominees available during the Steam BAFTA Sale. The full Call of Duty franchise from the beginning through Call of Duty WW2 is on sale this weekend. Find all of the games featured during the Steam Call of Duty franchise sale.